For the first time since I started blogging a big brand asked me to try their product. Napoleon Grills have a new line of gas grills called “Napoleon Rogue 425“. Some fellow bloggers who know the grills told me they produce some good quality gas grills. I’ve never cooked on a gas grill and was somehow challenged to get to know them. After all I’m a curious man and I wanted to know if it was really possible to get a BBQ taste from a gas grill. So I started talking with the brand. They proposed me to test their product for 5 months sharing some recipes and feedback. I’m not paid for this and get the opportunity to give some honest feedback! Besides the open and respectful approach they agreed adding a rotisserie and coal tray to the test product. So if gas is nothing for me I can cook on coals and finally I get to use a spit roast! More about the grill later! You’re here for the “cider brined spit roast chicken”. The past week I’ve shared you some teasers. Some might have tested the apple cider brine by now. It took me a bit longer to share the full post but here it is. As you might have read before I got the idea for this brine by drinking the Blind Pig’s smoked apple cider I bought. To sweet for my drinking tastebuds but a delicious base for a brine. For the rub I made a basic rub from scratch. The “Ground Bricks chicken mix” (thx David for the name) is a well balanced smoked paprika based chicken mix that compliments well with roast chicken. 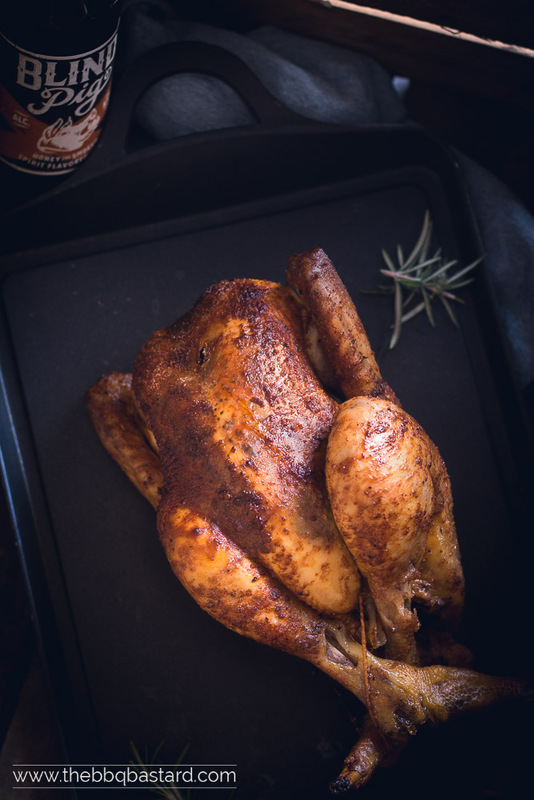 The sweet and tasteful brine with the gently spiced rub and some lemonwood smoke make this cider brined spit roast chicken something to drool for! You should have smelled it! Using the spit roast for a first time was a bit challenging. In “Project smoke!” by Steven Raichlen I read the chicken should be placed on the spit so it’s going overhead. When placing the chicken like this it was impossible to put the chicken in the middle of the Grill and still use the grid. Since I wanted to prepare some potatoes and vegetabels on the same grill I decided to put the chicken on it’s side in the middle of the grill. I lid the burners on the left and right for indirect cooking at 180°C/350°F and put a cast iron pan filled with lemon wood dust on top of the burners. This produced a nice and subtle wood smoke bringing some BBQ taste to the cider brined spit roast chicken. You might understand by now the result was very delicious! Does this mean it was perfect? No actually there was room for improvement. Especially on my skills since the taste was quite awesome. Next time I’ll add more wood. It works to add a smoke taste but I think I’ve been a bit to hesitant with it. But the biggest “fault” I made was the decission to skip the olive oil on the skin. I thought the chicken was rather fat skinned and hoped it would work well for a crispy skin. It did to some point. But I have to admit some of the skin wasn’t crispy enought. Thumbs up for the next session! Thank you for stopping by and checking the cider brined spit roast chicken. I have enjoyed cooking on my spit roast and hope you’ll try it too! More recipes will come so stay tuned! Meanwhile let’s take some time to chat in comments below or on Facebook! Testing my new spit roast for this cider brined rotisserie chicken. Delicious tasteful chicken with a well balanced taste. Soft and slightly sweet on the meat with a nice spiced homemade rub. The ground bricks chicken mix pimps your roast chicken. 6 hrs. 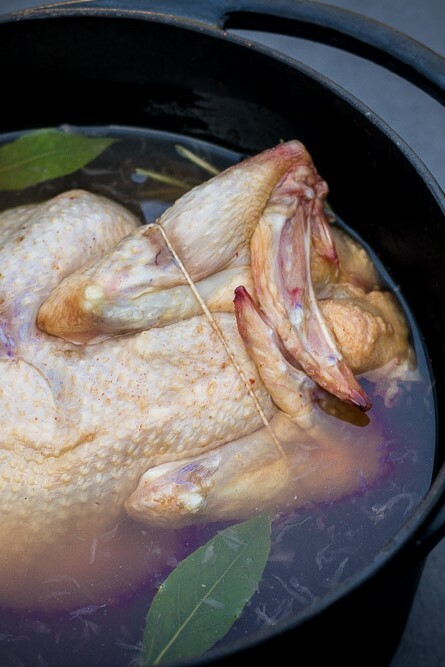 to a night before the cooking session brine your chicken with the Apple cider brine. Recipe here! An hour before the cooking session remove the chicken from the wet brine and pat it dry. Remove the skin from the bottom of the chicken and rub 1/3th from the ground bricks chicken mix (recipe here). Rub 1/3th on the outside of the chicken and the other 1/3th inside the chicken. Rub all spices thouroughly in the skin and body. Put the rosemary inside the chicken and put aside for another hour. Meanwhile start your BBQ for indirect cooking at medium heat 180°C/350°F. When using a gas grill like the Napoleon Rogue 425 you remove the grids and light the outer burners (max heat should give the desired temp). When using a kamado BBQ you can use a platesetter and in case of a weber you split the coals to the sides of your kettle. Put a cast iron pan with lemon wood dust on top of the burners or coals. While the pan is heating you can put the chicken on the spit. Make sure the forks are firmly fastened so the chicken is strictly secured. Otherwise it won't grill equally. Once the smoke turns blue put the spit on the rotisserie and cook the chicken for about 1h -1h30. Until it's reaching an internal temperature of 74°C/165°F in the thickest part of the thigh (make sure you don't hit the bone). 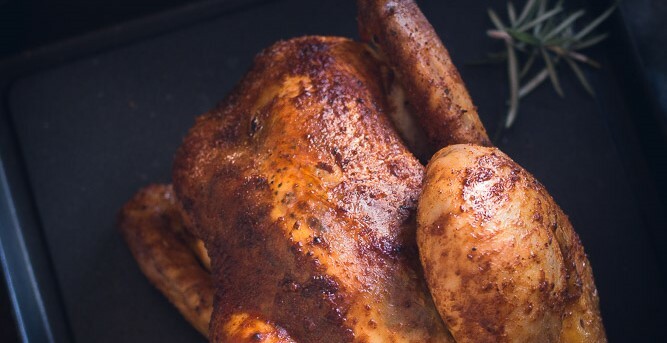 For a crispy skin you can spray some olive oil on the chicken and finish the roast chicken by heating the middle burner for the last five minutes. Remove the chicken from the spit roast safely! The spit and chicken are very hot and the juices are running out of it! Make sure you don't burn yourself! Use gloves and make sure no kids are in the danger zone! Rest the chicken for 10 minutes. Now you're ready to serve! - I got the "Napoleon Rogue 425" and "spitroast" from Napoleon Grills for 5 months to test their product. - There's an affiliate link on the book "Project smoke", "Napoleon Rogue 425", "Spitroast and "Lemon wood". - All other products where bought. 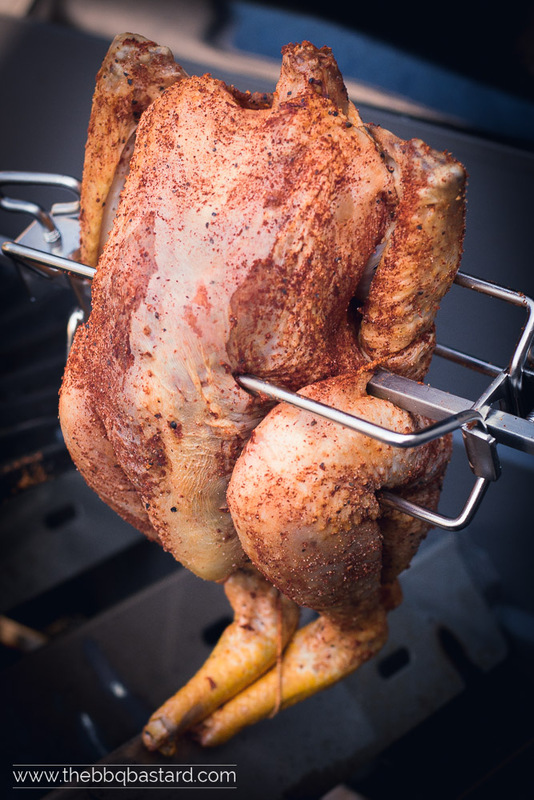 I’ve always wanted to spit roast my own chicken, this looks so good. I need to look into these grills. Yeah you do! They are an easy option for cooking great meals! I was a little resistant before using them but I have to admit they are a nice addition to my collection. Since I have the gas grill I BBQ every day! Yet I love the coal BBQ too! It’s just different! This looks absolutely incredible. Rotisserie chicken is on my shopping list each and every week as I love to use it as a protein source for my salads. But it’s always store bought. We move in about a month and will have space for a grill so your post is inspiring me to try my hand at my own rotisserie chicken. Glad to inspire you! You should really try it in a month! I think you will enjoy it for sure! It’s really worth the effort and as you mentioned perfect to make some extra for salads and stuff! Enjoy! I’ve heard great things about gas grills! I only grill veggies but sounds like a great option! That looks delicious and so many different ways to use it too. A great way to use your new grill.